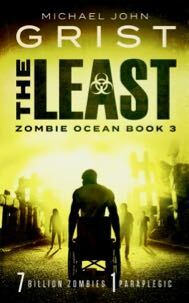 The Least is Book 3 in the thrilling Zombie Ocean series. 7 billion zombies. 1 paraplegic. His spine is broken. His mind is broken. He’s a decent, kind man who has suffered far worse than he deserved. He’s stuck in a wheelchair among 7 billion zombies. ‘Born on the 4th of July’ crashes into the zombie apocalypse, packed with gore, twists and unbelievable heroism. Buy The Least, Book 3 of the Zombie Ocean, in e-book format now!